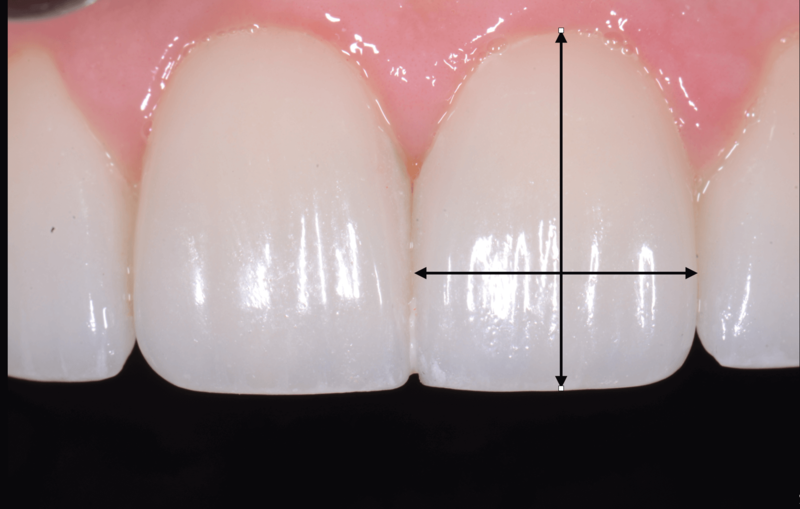 The second of the esthetic zone ratios looks at tooth proportion. Upper anterior teeth look their most esthetic when the ratio comparing width to length is between 70-80%. This proportion can be measured on a computer screen in pixels using programs like Keynote or Powerpoint and inserting the image into a slide and adding a line as I have done in the image in this post. It is also easy to figure out this ratio by measuring on a model with digital calipers, or from a printed image using a ruler. 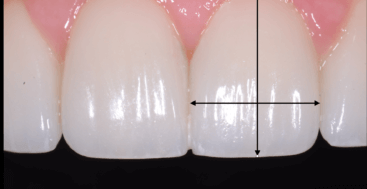 If the tooth has a width to length ratio that is less than 70% or greater than 80% and we are going to treatment plan changing it we have to determine where we make the length adjustments. The fist step is to determine the correct position of the incisal edge in the face using a lips at repose or rest photo. From the proposed incisal edge position we can then determine the proper position of the free gingival margin using this ration.